There are tens of thousands of corporate gifts and promotional products called “environmentally-friendly”. Some are made of various proportions of recycled materials, while others are made of materials that can be recycled. Ask us for a complimentary “idea presentation” if your project requires products with minimum levels of recycled materials, if the materials must be from post-consumer waste, or if there are other mandatory specifications. We have products made from recycled paper, recycled glass, recycled tire rubber, recycled currency, recycled newsprint, recycled denim, recycled plastic, recycled yellow pages, recycled sawdust…and more. Here is one example of an Eco-Friendly award, This award is a 4-inch lucite half-sphere with flat base, containing a recycled glass marble created to look like our earth. 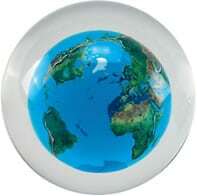 You can see the continents, and even rivers, within the tiny glass globe. Your logo placed on this award. For more ideas, click here and look for the category, “Eco Friendly”. Have fun searching, or call us at 949-786-9268 and we’ll do the searching for you. 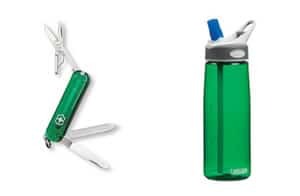 For all orders of “environmentally friendly” promotional products over $500, you may choose a “classic” translucent green Victorinox Swiss Army knife or a green .75 liter Camelbak water bottle.